It may seem an unlikely time for a global super luxury brand to launch a new concept on Madison Avenue of all places. Indeed, take a stroll up Madison Avenue and one will see a number of vacant storefronts with "for lease" signs in the windows that are too numerous to count. But that is where Hermès diverges from the rest of the luxury industry.While other stores are closing, Hermès will open its first store entirely dedicated to men's ready-to-wear, accessories and art of living on Wednesday. Located at 690 Madison Avenue in New York, "Hermès Man on Madison" will stand directly across the street from the U.S. flagship store. The 2,450 square foot store is the first Hermès boutique in the world that is dedicated to men only. Housed in a classic brownstone, the store's ground floor will offer a comprehensive collection of shirts, ties, perfumes, small leather accessories and watches, while the mezzanine will feature knitwear, sportswear, belts, hats and luggage. Men's suits, shoes and briefcases will be featured on the third floor with the fourth floor devoted to made-to-measure, including bespoke suits and knitwear as well as special order items. Simply put, Hermès is a company that performs better than its competition during tough times because its customer base includes the super-affluent, many of who have proven to be recession-proof. Indeed, while the retail industry is struggling to emerge from one of the most tumultuous economic years in recent memory, Paris-based Hermès International is doing just fine. The company recently reported an 8.5% rise in 2009 revenue (11% on an organic basic) attributed to an end-of-the-year increase in sales of its iconic Birkin and Kelly bags. Sales increased by a robust 20% in the Americas, compared to 12% for Asia and 9% in Europe. Revenue for the year rose to EUR1.91 billion from EUR1.76 billion a year ago, outperforming the company's previous target of flat sales. "This is among the best performances posted in the sector," says J.P. Morgan in a research report published this month. Robert Chavez, president and chief executive of Hermès USA explains the company's success to DailyFinance this way: "Our customer is less affected by the recession than the general population," he says in an exclusive interview. "But these clients did become much more discerning. They are not free-spending. But when they do make a purchase, they want something that is more versatile, that will last and endure. Our clients want something that will last them for a long time." This flight to quality explains the appeal of a company like Hermès, which has always been known for its craftsmanship and quality. Indeed, since 1837, when Hermès opened in Paris as a maker of harnesses and saddles, six generations of enterprising artisans have continued to extend their range and conquer new markets. Today, Hermes is a global super luxury brand which designs, produces, and distributes personal luxury accessories and ready-to-wear. "Hermes Man" will feature exclusive products that were made specifically for the new boutique. Exclusive items include a selection of silk ties, including one with the Statue of Liberty next to the Eiffel Tower on the front, while another has an apple motif and comes in four different colors. On the reverse of the ties, "Hermès Homme" appears, which is a signature for the new line. 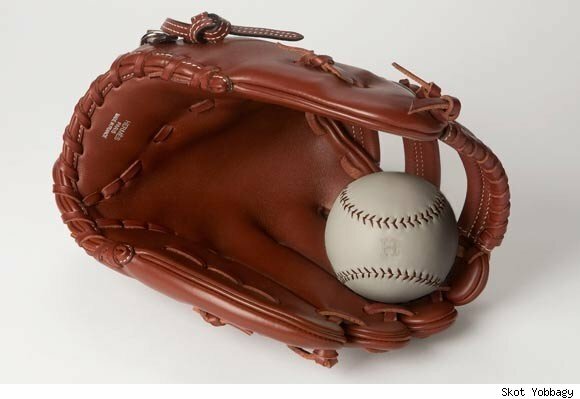 Another signature product exclusive for Hermès Man, is a handcrafted leather baseball glove, which retails for $8,500. "The baseball glove is a new product," says Chavez. "It has never been made before by Hermès. We thought if we are opening our very first Hermès boutique for men in the world and it is going be in the United States and in New York City, then we need to make a baseball glove. When you think about it, with the leather and the stitching, it is a natural fit for us." The ground floor of the store will offer a comprehensive collection of suits, ties, perfumes, small leather accessories and watches, while the mezzanine will feature knitwear, sportswear, belts, hats and luggage. A more intimate setting showcases the mens suits, shoes and briefcases on the third floor. A quick peak at men's suits revealed prices ranging from $5,500 to $20,700. Stunning crocodile jackets were priced as high as $129,500 and can be custom ordered if a special size or color is desired. The crown jewel of the store is a made-to-measure program that will be housed on the fourth floor, which was designed to evoke the serenity of a private home. Here, clients will select fabric and be fitted for custom suits which are made to order in France. The suit will be shipped back to the NYC location and a second fitting will ensue. If alterations are necessary, they will be done at the Hermès store by an in-house tailor. Hermès has long offered a made-to-measure program at its flagship store in New York, but the facility was small. "We offered it across the street, but we really hadn't planned for it," says Chavez. "We took an existing fitting room and transformed it into a made-to measure room. It worked and we were surprised at how much business we were doing out of this little makeshift space. But when this opportunity surfaced, we knew immediately that the fourth floor would become a made-for-measure salon. I think our customers are going to be thrilled." 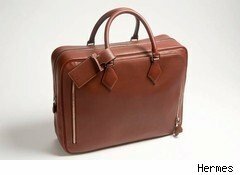 Are there plans to open more Hermès Man locations in the future? "I am sure the company will watch and see what happens here," says Chavez. "If it is a big success, which we are pretty confident it will be, who knows what can happen elsewhere."